Rose Melberg of the Softies and Pam Berry of Black Tambourine during Black Tambourine's set. Photo by Dominick Mastrangelo, originally posted on Brooklyn Vegan. 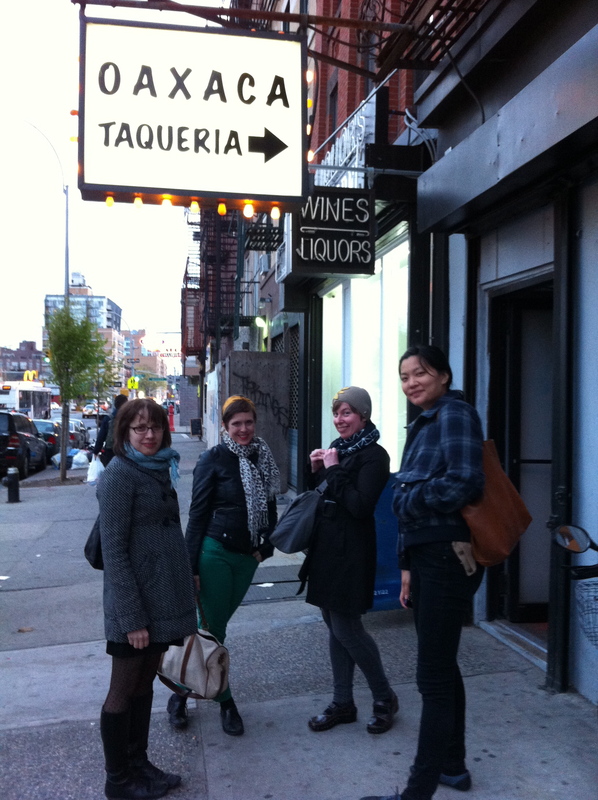 Zine Girl Army reunited. Keight "Pink Tea," Eleanor "Indulgence" (me! ), Marissa "Red Hooded Sweatshirt," Yumi "External Text." Photo by Laura "Other Ramona." Chickfator was, at times, infuriatingly snobby and unabashedly self referential. 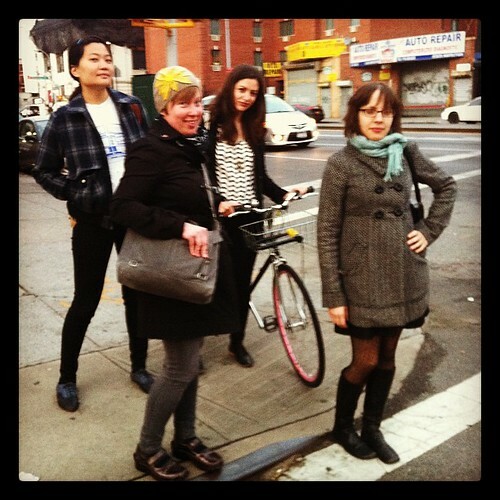 The editors, Gail O’Hara and Pam Berry, had impeccable taste in independent and underground pop music. The magazine was mostly a showcase of the editors friends and they referred to them by their first name and the name of their project, for example “Gail Chickfator.” In the late 1990’s and early 2000’s I loved to read it for a window into a world of indie musicians, both ladies and dudes, that interacted and partied and frankly, existed, somewhere outside of my small town, teenaged life. My friend Alex used to get so annoyed at Chickfactor’s inflated tone of self-importance he would rant ad nauseam on about it, but of course, couldn’t wait until the next issue came out. 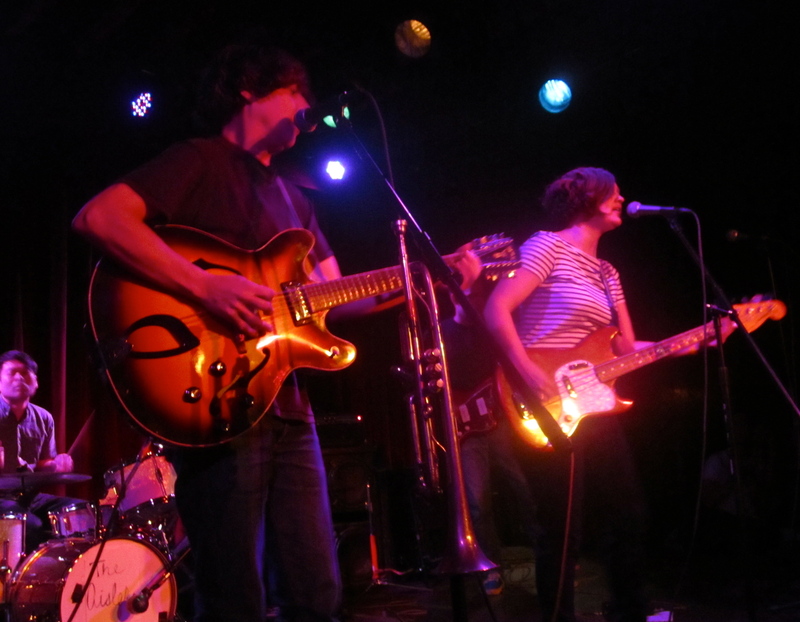 Chickfactor, and other zines like it, set the tone and the scene for today’s music blogs and helped paved the way for the explosion of indie pop bands like The Pains for Being Pure at Heart hitting it big time. No matter how you felt about it, Chickfactor had a magnetism and a draw larger than the publication itself. Twenty years later they were able to pull off a three-night extravaganza in two cities featuring bands who I thought had long since broke up with no chance of reunion. Lois, Small Factory, and Black Tambourine. And the Aislers Set! A favorite band from the moment I heard them in 1998 until they stopped playing so frequently, perhaps circa 2004? Since my head has been in the sand about music since about 2008, I relied on Dominick to give me a hot tip about the reunion and bought tickets the minute they went on sale. More Zine Girl Army! This time with Laura! My friend Kirsten “Lightening Bug” surprised me by flying into Chicago. 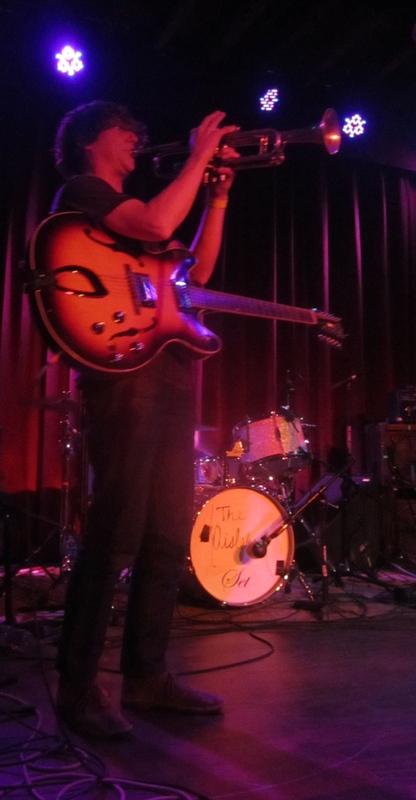 We staked out space by the front of the stage for Black Tambourine and the next night, for Aislers Set. She reminded me that she had visited me in NYC in 2002 to see the Aislers Set in Williasmburg when I said something to the effect of, “This neighborhood is just getting really gentrified” to explain it to her. “It’s our 10 year Aislers Set reunion!” she announced. The reunited bands full of energy and sparkle and sounded as fresh as they did ten or fifteen or twenty years ago. Lois performed with Peter from Heavenly and Molly Neuman and played “Strumpet,” which I quoted on my senior page in the yearbook. Lois performing with Pete from Heavenly. Photo by Dominick Mastrangelo, originally posted on Brooklyn Vegan. Pam Berry singing in Black Tambourine. Photo by Dominick Mastrangelo, originally posted on Brooklyn Vegan. Black Tambourine were revelatory. So many bands now are playing washed out, reverbed out, noisy music with bitter sweet vocals (ahem, my band might do this too), but Black Tambourine helped start that sound. Hearing them alive made all those who cite them as a reference seem pale in comparison. Small Factory also rocked out with upbeat disappointment and plenty of jagged, self effacing lyrics. They played one my favorite song, singing the chorus loud and heartfelt, “I’m not giving up, I’m not giving up on nothing, I still believe in nothing, just not so much in love.” To hear these words ring out over buzzing guitars and a sea of people left me feeling like if I’m still here, still listening to this music and still loving it as much as ever, I must have done something right in my life. The second night British folk singer Bridget St. John entranced me with her ethereal yet earthy songs, but the real highlight for me was The Aislers Set, who played at the very end of the night. My friends and I staked out space in the front of the stage and refused to move. “We’re doing this 90’s style!” Constance announced, meaning, we’re staking our claim and not moving, just like we used to do as younger music fans. It was worth it. To have no frustratingly tall people between us and Linton and watch every strum of her 12 string guitar was better than I could have even dared to hope for. I love the Aislers Set. Their songs are catchy and poppy, and Linton’s lyrics are like stories that you tell someone about the small thoughts you have everyday that somehow add up to a profound reflection on your life. Her imagery always makes me soar, “The queen of every rooftop,” is one line I love. Their sound is big – big guitars, big pounding drums, big layers and harmonies, but still delicate and jangly. As I soaked in their songs I realized a significant portoin of my life from about age 18 to 23 was spent listening to the Aislers Set. When they played “Mary’s Song,” with its wistful start and bass line that comes in like a tug on your heart strings tears came to my eyes. In away, I thought, my dreams from the time I listened to these records on repeat have come true, but I still feel the same wistfulness and longing that this song so perfectly captures. When the Aislers Set took the stage an audience member cried out, “It’s been too long!” Indeed, it has been. My life has been missing the Aislers Set. The multi-talented Linton. Trumpet and guitar at the same time! So if you know me even a little bit you know that i don’t go out much. I like to have a good time, sure, but partying until dawn is not my usual m.o. unless, of course, the party is CHERYL. CHERYL started two years ago by a group of stylish people who mostly worked in museums. Its tagline is “the dance party that will ruin your life” and every month features a different theme and a video that can only be described as a piece of art to go along with it. The party has gained momentum and attention and moved to progressively bigger venues. 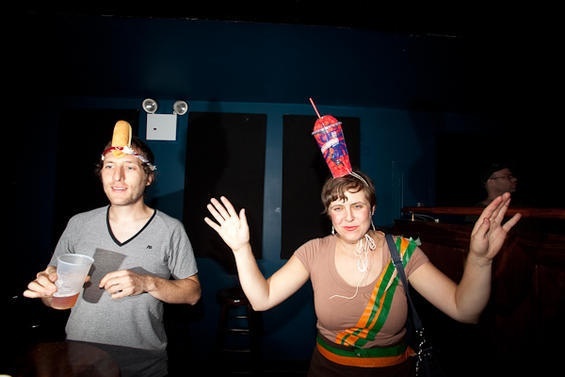 I love the fact that while dressing up is encouraged it’s not required and that it attracts a mixed crowd of, well, pretty much everyone who likes weird (but not that weird) arty and really honestly fun and unpretentious parties. This time around the theme was 7-11 and the Village Voice showed up to take pictures. Thanks to my handily constructed Slurpee hat apparently I was quite photogenic. Who knew I would be a nightlife icon for a fleeting second? Check out the rest of the Voice’s photos here. I also put photos on my flickr stream. I’ve been going to some great shows lately and Dominick has been taking some great photos! Just this week we saw Camera Obscura at the Bell House and they were breath taking. They were much better than the last time I saw them in New York at the South Street Seaport. They’ve really grown as a band and their new album “My Maudlin Career” illustrates this very nicely. Check out my review and Dominick’s photos here. We also saw the French Kicks not too long ago and you can read that review here.